I am sure that you are longing to hold your own child in your arms. I understand that you must have been striving to become a mother. Sometimes it can seem like a very long wait, especially if you are undergoing treatment for infertility. Don’t be despondent. There is hope. Thousands of women who have wanted to get pregnant for a long time have been blessed with a child by the grace of Goddess Garbarakshambigai. The Goddess Garbarakshambigai is seated in the Grabarakshakambigai temple. The temple is situated in Thirukarukaavur, Papanasam Taluk, Tanjore District, Tamil Nadu. ‘Garba’ means ‘womb’, ‘Raksha’ means ‘to protect’ and ‘Ambigai’ means ‘The Divine Mother’ (incarnation of Parvathi). A remarkable feature of the temple which distinguishes it from the innumerable other shrines of our land is that the Goddess Sri Garbharakshambika not only protects the embryo but also blesses people who long for a child. You can read the story of Garbarakshambigai Amman and more details of the temple. For centuries thousands of devotees, across the country, especially from South India visit the temple and offer prayers and special pujas to seek the blessings of the Goddess. Most of them have been blessed. They have conceived children and have gone on to deliver healthy babies. You can read more testimonies here. 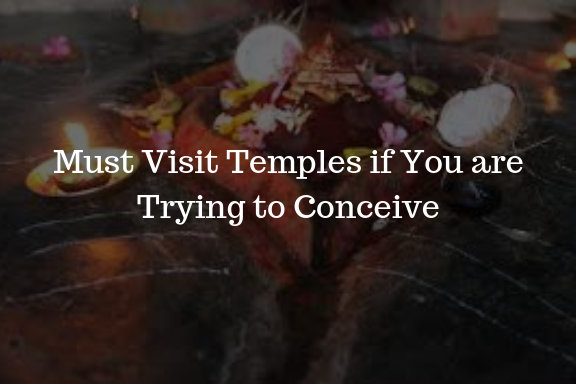 Women who want to get pregnant have to offer a puja at the temple. The prasadam given is ghee that has been placed at the feet of the Goddess. This ghee has been charged with mantras. This ghee prasadam has to be mixed with a quarter Kilo of cow’s ghee at home. This has to be consumed in small quantities for 48 days by both husband and wife. This ghee prasadam should not be consumed by anyone other than the couple trying to conceive. Apart from consuming the ghee the women are also encouraged, if time permits, to chant the following Slokamsm 108 times every day. A special Pooja and Pushpanjali can be arranged at the Garbharakshambika temple help to overcome problems related to pregnancy and childbirth. Annadanam can also be offered at the temple. We understand your predicament, you cannot travel hundreds and thousands of kilometres to be present personally at the temple of the Goddess. We are here for you, to serve you and offer the pujas and prayers on your behalf. We will observe the strictest rituals in performing the pujas and will forward the temple prasadam directly to you. Book the puja and invite the blessing of the Goddess Garbarakshambigai into your womb. I have sent you a reply by e-mail with details about puja. Please do not worry. Those who have had prasadam from Goddess Garbarakshambigai have conceived after several years of being unsuccessful. In my experience I have sent prasadam to people who have tried to conceive unsuccessfully for 19 years, some for 16 years etc. After taking the prasadam they have been blessed with a child. Let us hope that your prayers are answered. Mail. It’s 6 years of our marriage not Conceived so far. I can’t come to temple soon, I stay in Dubai. Am planning to conceive from past 7yrs. This time I want to start Amma pooja at home. Can I get prasadam to Dubai? And details about when to start pooja? I understand how very worried you must be. Please place your fait in Garbarakshambigai Amman. She has helped thousands of devotees with problems to have easy and safe deliveries. I have sent you details of puja by e-mail. I pray that you always have Amman’s thunai with you. I visited the temple last year and also had the ghee for 48 days but their is no positive result till today. every month expecting a positive result but always getting a negative. really dono what to do??????? Its almost 3 yrs got married. worried very badly. Even visited doctor also, their is no problem at all. please suggest me some positive way. There are some slokams here: http://garbarakshambigai.org/stotrams/ that you can try chanting. Keep up the faith and please relax. I am sure by the grace of Amman something will work out soon in your favour. Dear amma, I have been married for 10 months and trying to get conceive. Doctor say im having pcos. Im chanting ambigai mantras whenever possible. Is it neccessary to chant 108 times? What is the procedure for the prayer? Im in singapore. Currently I couldnt travel to visit temple. Can I request for puja to get conceive. How do I register? And what is the fees? There are no restrictions on how many times you chant the slokam. Chant as many times as is comfortable for you. I have sent you details for puja ny e-mail. We regularly send prasadam to Singapore. We would complete 3 years of marriage this Jun. We have been trying to conceive since 9-10 months now. Our plans came to a halt due to male fertility issues. We are currently taking treatment for him. Everyday I recite lot of prayers to Santana Gopala Swamy, Vamsa Vrudhi Durga Kavacham, Aditya Hrudayam, Putra Prapti Astakam. I came across this site and got a real positive feeling after reading through all the testimonials. As ours is a male related issue, can I also recite Garbarakshambigai Amman stotram? I shall follow the process diligently. Hoping that Amman will shower her blessings on us soon and we can hold our child in our hands! Please guide me for any process to be followed during the chant of the slokam. It is good to see your devotion. Placing our faith in God will either yeild blessings or at the very least it will give us the strength to face our problems. You can chant the Garbarakshambigai Stortam, there are no prescribed methods. You can do it as many times and in whatever way you are comfortable. May you soon be blessed with a happy healthy and beautiful baby. I am trying to conceive but no result.i stay in singapore .please advise me which puja to be done in temple and what are the fees.i will send. In the last week I have heard from so many people who have been trying to conceive for a long time and have succeeded after praying to Amman. There is no reason you should not be blessed,. Keep your faith strong and who know’s what blessings you will receive. I have sent you puja details by e-mail. I have been married for more than 1 year and trying to get conceive but its not happening. Currently my husband is in US am in India can’t visit the temple. Can i perform the pooja at home and chant the Garbarakshambigai slokhas. Please guide us details of pooja and slokhas. Please do not worry and have faith in Amman. Everything will be all right. Your idea of doing puja at home and reciting the slokas in a good one. Once our husband is back you can either visit the temple or order prasadam through us. We will send you ghee prasadam that has been offered at the feet of Garbarakshambigai Amman and this prasadam has to be consumed by both husband and wife for 48 days. When taking the prasadam it is necessary for husband and wife to be together. We had completed 5 years of marriage. till we are not blessed with a child. my husband is diabetic under treatment. had gone iui also but not successful after the 1st year of marriage my father in law ordered the garbarakshambigai prasadam and gave us, took it for 48 days. later in the year 2012 we had visited the temple got the ghee prasadam and them but till now we are not blessed with a child. i don’t what sin we have done. i scared and depressed whether will i give birth to a child and can i become mother. please guide us. hoping the garbarakshambigai amman will bless us. I can understand your pain and frustration. Please do not be disheartened. Continue with faith and prayers and let us hope you will be blessed soon. Though most prayers are answered soon we cannot understand the mysterious ways of Amman. Trust in Her powers and let Her decide your faith. If you will bear a child or not is in Her hands. Learn to a develop a faith that accepts Her will and you will it easier to cope with your problems. Having said this I do hope your prayers and answered soon. Its been 5 yrs to our marriage. We are not blessed with a Child yet. Treatment is going on since 3-4 yrs. The problem is with me, not with my husband. Every month we are spending around 15-20k for the treatment and 15 days going in DR visit. But no result yet. I conceived on dec 2013 after a long try. But unfortunately, it was implanted in tube instead of Uterus. So i had to do a immediate surgery and i lost my left tube 🙁 . Now i left with only one tube. I have cyst problem also. I really loosing hope and going into a depression level now. Also loosing my believe on GOD. Since 4-5 yrs , every month i am keeping a hope. But no result. Please help me and guide. I dont know what to do now. I already lost my patience. I request you to pray for me. I can feel your pain and frustration. Let us hope that your prayers to Amman are answered soon. Thousands have been blessed before this and let us pray that this grace extends to you as well. I have sent you puja details by e-mail. I hear that it is necessary for both the husband and wife to come to the temple to get the puja done, they dont allow only the wife or just 1 partner to do it. Is this true? Currently both of us are abroad but im coming to India shortly and plan to visit the temple and do pooja. My husband wouldnt join me this time. Is it possible that i can attend the puja alone? What is the arrangement in this situation? Amma, I am nearing 1 year for my first anniversary. we confirmed my pregnancy the next immediate month from our marriage date. My baby was fine and healthy till fourth month. When i was in 5th month pregnant, i suffered by viral fever (dono know the reason for this fever at all… i was healthy all the days… :<) and got admitted at hospital. When we did 7th month scan, we came to know tat my baby had lot of problems like kidney was not functioning and pericardial fluid around my baby suffered him to breath properly. So doctor adviced us to terminate our baby at that time. I felt like i lost everything and i dont have interest to work and live without him. It is almost 5 months over… i lost him on Feb20th… Now we are planning for 2nd baby and plan to visit Garbarakshambigai temple… this time god should bless me to have my baby back… i love him amma… i have lot of family problems also.. had lot of stress during my pregnancy. This time everything should be positive for me. she needs to shower her blessings on us. I am sorry to hear about your loss. It is good to know about your plans to visit the temple. With rich blessings from Amman let us hope that you should conceive again soon and that there should not be any complications this time. I hope Amman showers Her blessings on you. We have issue with the children after Birth. Our two baby girl child died after born within the duration of 3 month. We are very depressed and clueless because the actual problem in children are not able to diagnosed by Doctors. For them everything looks fine. Can you please help us in any way? 108 times . As we are staying in bangalore my husband hectic work is here only we cannot come to Garbharakshambigai temple . I am interested to perform puja from home itself and receive Goddess Prasadam. Kindly help me out for this we are eagerly waiting for boy and girl twins baby. Please Please help, I have come to you with lots and lots of hope and prayer to conceive and get pregnant. Please Please I request you too help me to seek blessings of Goddess. I am very fearful of future and sometime ago i was also thinking of suicide. Now I have decided to help myself …I am praying and chanting everyday…i m also doing 16 mondays.. also called as Sola Somvar.. I am prayer and eagerly waiting to seek blessings of Goddess Garbarakshambigai and be blessed with a beautiful babies.. I had got Married 16 months ago. i am not conceiving, so pls tel me. 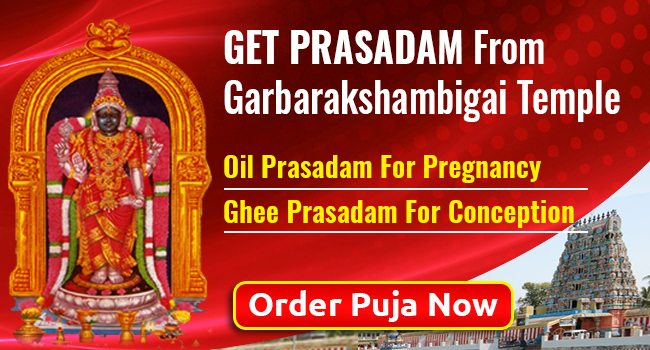 how to get Ghee Prasadam of Garbarakshambigai Temple……………to get conceive.i want to know the charges of Prasadam. I have been trying to conceive for the past 2.5yrs but isn’t possible…There are no problems with me nor my husband. I Am trying to conceive…Each month am expecting a good result… but not getting a good result …. feeling very bad..plz do help me…..
I’ve been trying for baby since 3 year. i went for IUI thrice but no success. please send me the procedure. I’m devastated. I got married two yrs back and i lost my pregnancy during 2 nd month itself in last Jan.
we don know the reason for it.. Pl, advice me how to get prasadham from temple. I would like to do the pooja to conceive. would please mail me the details for that pooja; that is when to do and at what time to do. I have been trying to conceive . Please tell me how I can order the ghee prasadam ? I have sent you details by e-mail. Im married for four years. Too many obstacles to try for baby. Looking forward for miracles to happen. Need amman blessings! Please send me puja details I am in TTC for 7years and failed IVF in last month. Please help me. I am Reshmi married for 7 yrs. Trying to conceive for the last 5 yrs. I have thyroid, cysts, endometriosis, fibroids. 3 surgeries and lot of medication but no luck. I accidentally came across the website. I want to come to the temple and visit my amma. My husband is now in UAE. I am in kerala. Can I come n do the puja alone. Day by day I am becoming depressed. I am 36 yrs old. I am not able to conceive. I would like to offer my prayers and sevva to god. I live in the US. I cannot visit the temple personally. Please send me the details. I will be happy to arrange for the puja on your behalf and send you the prasadam. We do send the prasadam to USA and also any other country. With the blessings from Amman I hope you soon conceive a healthy happy and beautiful baby. We got married 2010 almost 5 yrs completion of my marriage,but still aim not conceive..
any problems related to pregnancy then also we are worried. i have a niece and her marriage had 11years but she cannot conceive…. she stress herself when she will be conceive…she love children but she doesnt have any….. some of her paternal in law do black magic she scares alot…. sometimes she get disscusion with her husband about she cannot conceive…. PLEASE AMMA HELP MY NIECE….her name is meenakshi….. show her a way AMMA……..
HI Janani, Me and my wife are ttc .Last month she had a miscarriage in the early stage.We need to book pooja and receive amma’s prasadam.Please send us the pooja details to my mail . I got my positive pregnancy test results but having some complications. Already had miscarriage 6 months back. Please send me pooja details. We visited temple on 2012 yearend. Had prasadam chanted sloka also. But I hv not conceived till now. Could you please send me the details of pooja and how do I get prasadam? I live in US. My Name is Richa I am married for last 8 years no baby had miscarriage in 2013 since than not able to concive . Amma.. I’m 31 years old.. I’m married wen I’m 26 years old.. So long I’m waiting for get pregnant. I feel hurt by hearing some ppl talk about me and thy thinking tht I can’t get pregnant in my life. Pls Amma be vt me and I want to get pregnant soon..
We have been trying to get pregnant from past 2 years. We live in US. Could you please send me the details of pooja and how we can get Amma’s prasadam? Hope Amma will shower her blessings and bless us with a baby. Thanks. I am Sunitha living in USA . I am married for 2 years but did not conceive. Doctors told I have low egg reserve. I heard about amma . Can you please send me ghee Prasad? And also share pooja details. My daughter is married for 1 yr and 5 months and had a first baby in Dec last yr. Unfortunately the happiness only lasted for one month and Jan doctor found that the baby didn’t grow and heartbeat stopped. My daughter is having fear of this and very worried and asking me if she can ever conceive again. I am very upset and need your advise on what to do . Please help us – We stay in Singapore. Hi madam i am viji married for 1 year since i dint get a baby. I hv thyroid problm in startng range lik tat doctor said. Bt nw she said this is the reason to nt getng pregnency. So i dnt knw wt i do.. plz i wan a baby plz help me mam…. I got 2 miscarriages and I am depressed got a doubt whether i will get baby ? Can u send me the pooja and prasadam details. Married for 9 years. Not able to conceive. Medical procedure also no success rate. Want to get pregnant this year. Hoping others also get blessed with a healthy baby soon. Can you send me details regarding pooja and prashad? Also let me know if you need more details about my husband and me or any other medical details. My name is Kavitha. It’s been 3 year 2 months of our marriage. I trying to get conceive. We have gone for treatment there is no problem doctor has told. So plz help me in God’s miracle to get conceive. i visited the aug 15th 2016.we had ghee prsadam also.but my sister has deliverd,i have to go,my husband not coming because of work.after coming i have to continue taking ghee prasadam. I had ghee and chanting the mantras 108 time every day…I have no child…please bless us… Now I have no hopes….please help us. This is Nandini Dayananthan and I am trying for a baby for the past one and a half year, I have PCOD problem. So I would like to do the puja, I live in Norway. Please guide me to do the puja. Amma please bless us with a baby. Please respond asap. I have been married for 5 years now. Trying to conceive for past 2 years . Had 2 ivf cycles. Very depressed. Amma led me to this website I presume. Kindly let me know how the puja can be performed at home . My name is rathnamala,im 29 years old.i completed my married life of five years but still now we we are not having children.my husband name Dharmendra now he is 36 years old. Amma kindly help us plz what I should do for children ,I had taken many treatments ,but everything failed,main thing my husband will not use tablets regularly.but he is a very good husband,some laziness. I can visit the temple alone,are we both should come to visit the temple.p lz reply me. I need children ,as early as possible amma,bcoz im entering in to 30 years ,I’m feeling very tensed,and other people are also scaring me,now you are 30 years it’s not possible for kids. Plz amma give me your valuable suggestion. My name is Babitha. 38yrs. I got married at a very late age. Trying to conceive. Please help me. To Concerned: Please let me know the pooja details. I am from Bangalore. What are the fee structures? and how would you be sending me the prasadam. I got married before two & half years ago. But I still didn’t get conceived.I have Pcod prbm. I am 29 yrs old. Plz pray for me. I got married 4 yrs back n trying to conceive since then… Pls help us.. Pls send us the details of pooja n payment so that we can devote the Lord with all our faith.. I am married for 4.5 yrs, but planning to conceive from past 6 months. I have booked for ghee prasadham, please let me know what should i do next procedure. Please help me. Hi this Yashaswini we completed marriage life of 5years but still now we don’t have child . I have some prbm. I am 30 yrs old. Plz pray for me. I came to the Temple a few days back but we came late but we werelucky to get Amman dharisanam but could not get ghee prasadam as the shop was closed. I want to order the ghee prasadam. Kindly let me know the formalities. After recieving ghee.. how many times we chant the mantra?? I am trying to conceive for 1 and 1/2 years.today i have sent money order today when i will recieve ghee prashadam. After the puja is performed on the day it is scheduled, the prasadam will be shipped and will reach you within 7-10 days if you are in India and 20-25 days if you live abroad. I would like to place an order for ghee prasadam. Is it possible to send to Malaysia? Yes 6 months old prasadam can be used but not older than 6 months.